If you're a metal player in the market for a SE Custom 24, or indeed just something that's not too pointy, then this may well be the right fit for you. Looks and sounds fantastic. Good value. Mark Holcomb is one-third of Periphery's guitar triumvirate and a self-confessed PRS obsessive. Mark first began working with PRS on his signature model a few years ago and that limited-edition, USA-made model attracted enough attention to be rewarded with its very own SE equivalent, which bears a very similar spec to his pricey American counterpart, right down to Mark's signature Seymour Duncan pickups. At its core, the Holcomb is basically a SE Custom 24 model, but with a number of significant differences: the mahogany neck has been replaced with maple; the scale length increased from 635mm (25 inches) to 648mm (25.5 inches); and the 'board radius has been flattened from 254mm (10 inches) to an almost flat 500mm (20 inches). The Holcomb Burst finish is stunning: a patterned quilted top wonderfully camouflaged by a smokey black burst varnish with a tiny hint of purple, straddling the perfect middle ground between pretty boy and metal monster. The overall build quality and setup is superb, as we've come to expect from the SE range. Although shipped in Mark's preferred drop C tuning (drop D down a tone, so low to high: CGCFAD), no special design considerations have been given to this lower tuning aside from the increased scale length, so it's no issue to choose standard tuning if preferred. The popular Wide Thin profile is the chosen neck carve, and it's been topped off with some chunky jumbo frets which, in conjunction with that super-flat fretboard, enable a low action. Those familiar with Periphery's brand of down-tuned prog-metal will be expecting an onslaught of high-gain attack when plugged in, and this SE certainly doesn't disappoint. Plugged into a Marshall JVM410, down-tuned riffs positively fly out of the speakers with a wonderful depth and resonance. Powerful as they are, they don't overwhelm the amp but instead output a punchy clarity that still offers articulation on even the heaviest of settings - no doubt the pickups are voiced to help showcase the open expansive chord work that Mark is known for. The coil-splits are also a joy, recalling the percussive distorted funk tones of Nuno Bettencourt. 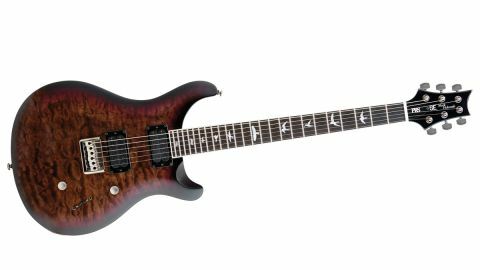 With most signature models, the specs often reflect the sometimes idiosyncratic needs of their inspirer, but this isn't just a guitar for fans of Mark. The spec on offer here represents a high quality and, dare we say it, 'posh' metal guitar with a little bit extra under the hood thanks to those versatile split-coil tones. The pickups are the star of the show and, if bought separately, they'd cost a whopping £300 alone! So, considering the guitar's price, their inclusion makes this package excellent value for money.